We have been having such a lovely week, cold but beautiful sunshine and all the daffodils are out in the garden, makes everything seem cheerful and Spring is definitely on the way. 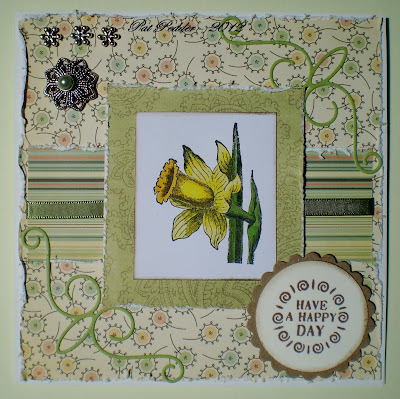 On to my DT card for the challenge at Fab'n'Funky which this week is "Mellow Yellow", I used a beautiful daffodil stamp by Anna Griffin and coloured with Copics. The papers are by Cosmo Cricket and My Mind's Eye, the sentiment is by Cuddly Buddly and the swirls would cut with a Memory Box Die. I finished by adding a jewellery spacer (which I flattened with a hammer) then threaded a pearl brad through and three small spacers. Gorgeous card Pat, love how you have attached the large spacer with a brad. A lovely feeling of spring with this :-), gorgeous daffodil image and I love those dps with the distressed edges. Thanks for joining in with us at LIIU, and good luck. Oh this is such a lovely spring card! Thank you for playing along with the Delightful Challenge Team this week. If you get a chance, stop by my blog to enter the March Big Prize. Cute card!! Thanks for joining us at Gingerloft's Challenge. Hope to see you again. Hi Pat! Very, very pretty card. You did such nice artwork on your flower and the background looks great, it all goes together so well. Thank you for entering Gingerloft's Challenge! Full of the colours of spring, Pat. Lots of work in this one and a great outcome. Thanks for joining us at LIIU this month! Stunning card ! thats a beautiful stamp too , really makes you think of spring ! What a wonderful card - I just love it - the colours and the image are just great - fantastic. Gorgeous card. Oh my, you do have a beautiful bunch of grand daughters. You always incorporate embellishments so perfectly Pat!! Love the daffidol! This is gorgeous Pat and I swear you do some of the prettiest design work I have ever seen! !